We were a little bit dubious when we heard that Polaroid had named meat-wearing songstress Lady Gaga as a 'Creative Director' of the firm. 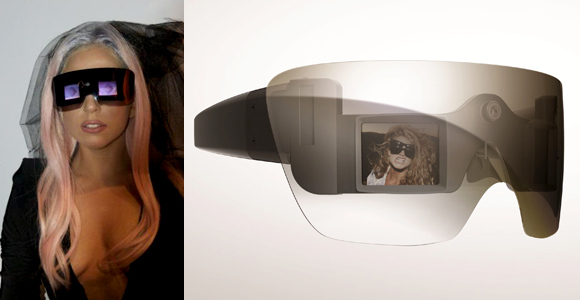 But after seeing the trio of kooky 'Grey Label' gadgets designed by Lady Gaga revealed at CES, it kind of makes sense. Almost. The most Gaga of the new products are the GL20 Camera Glasses -sunglasses which can take a photo of what you're looking at and then display them on a pair of 1.5 inch LED screens on the lenses. This is joined by the 'GL10 Instant Mobile Printer' which is Bluetooth enabled and designed to allow people to instantly print pictures taken on their mobile phone. Finally there's the most recognisably Polaroid product, the GL30 Instant Digital Camera, a 12MP camera with a built-in ZINK printer. Speaking of the role at Polaroid, Lady Gaga said: "I consider myself to be a visionary, not just a songwriter and a singer. I am an artist. "I brought my vision and love of fashion, technology and obsession with the future into all of my work with Polaroid. "I love all the Polaroid Grey Label products but I'm the most excited about the printer. "This product will revolutionise how we see photos. Your images will no longer die a death on your cell phone or digital camera."